We had an awesome stay!! Everything was Perfect! W hope to come back soon. Thank you for sharing your beautiful cabin and views with us. We come to this area 2-3 times a year. We love the mountains and these views were gorgeous. We will be back. We had a great time over the weekend while staying here. This was the 2nd time here for the family and the first time for one. It was so much fun. I hope to do this again one day. We had the best week! Wengen Chalet was awesome, clean, and beautiful1 This is our second time to Bryson City and second time in a rental cabin. I only wish we found GSCR last year. We enjoyed our guided fishing trip from Fontana Guides. This was our second time with Kyle. We took a hot air balloon ride in Ashevile. We enjoyed the NOC. The Cork and Bean was yummy. Again - thank you for offering an incredible rental! Thank you, thank you, thank you! What a wonderful relaxing time our family had! The appointments in your cabin were impeccable! All the comforts of home! The view is breathtaking. Just to be able to relax, undisturbed by the outside world was everything we could have dreamt. I must say the driveway was daunting, but worth it! Our puppies - Buddylove and LucyLoo - sat for ours on the deck, enjoying the view as well! What a special 7 days. We will be back! Another amazing stay with GSCR, you guys are the best. This was our first time at Wengen Chalet and by far this is the most beautiful cabin yet! This cabin was so relaxing we hardly even left. But we did find some wild berries on top fo the ridge. So delicious! This is our second time using GSCR and first time at this cabin - loved it! Beautiful views, especially from the hot tub under the stars. Has everything you need for a relaxing and stress getaway. Loved the floor plan, deck, and screened porch -- there is a beautiful view everywhere you look. Will definitely be back to enjoy. Great experience! This was one of the most beautiful cabins we have ever stayed in. So clean, neat and well taken care of. The views were amazing! Easy to get last-minute booking. Pleasantly surprised by call to assure we got in ok on day of arrival. 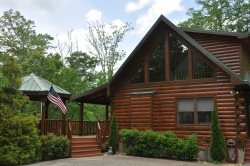 Customer service is what sets folks apart..
My sons and I shared this wonderful cabin and truly enjoyed it. Aside from the creature comforts on the inside, we loved the views (nature's gift) and the fire pit. I was here with about 40 other family members on a mini-family reunion. There were about 20 others who could not join us. We all had different cabins and had a wonderful time. This is a beautiful cabin. Made many awesome memories. We love the mountains and were very excited to come here on our honeymoon! The cabin is wonderfully stocked! The view is wonderful! Thank you so much! You guys were great to work with and made planning our honeymoon much easier! !